I admit it. I cried quite a few times reading this book. Besides all the emotional stories about grandparenting, it’s also got some very interesting studies of the relationship between grandchildren and grandparents. There was even a study of what happens when a grandmother holds her grandchild. We baby boomers are becoming grandparents now. (I know so many that have recently had grandchildren.) We are all the same and yet all very different. The book touches upon the different types of grandparents there are. Whether it’s your daughter or your son, your stepchildren, the children that a child brings into the family, they are all loved the same. There are also the grandparents that aren’t able to have the kind of relationships with their grandkids that they would like to. Those stories just broke my heart. 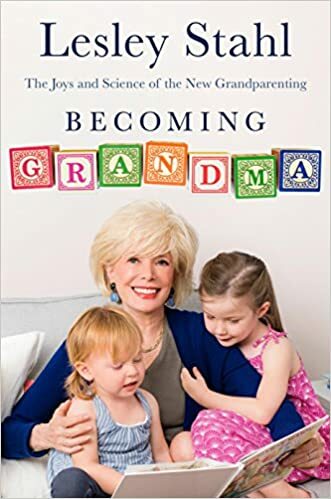 The book also recaps Lesley’s life as a reporter and how she felt about motherhood and the comparison to being a grandma or Lolly, as she is called. I am all for straight up Grandma. It made me think about my kids’ relationship with my mom, their beloved grandma. Lesley also writes about losing her mother so close to the birth of her granddaughter Jordan. Very touching. Something that has really stuck with me was when a friend told her that what struck her was that the seed of her grandchild was already in her daughter when she was a fetus in her body. What an extraordinary thought! And the generations go on and on and on…..
My son is with a wonderful young woman who brought an amazing little girl into our lives. She’s a dynamo and made us grandparents immediately. She calls my husband Grandpa Kelly and calls me Mom. ( I think because my son would say he was calling his mom.) And now, my daughter is expecting her first child, a son, in July. Just when you think your heart cannot get any fuller, you are a grandma. I am looking forward to that love that Lesley Stahl wrote so eloquently about when I hold Luke in my arms. This really is a great read for all of us who are grandparents, are going to be grandparents and for the children who make us grandparents.